Break out your berets! 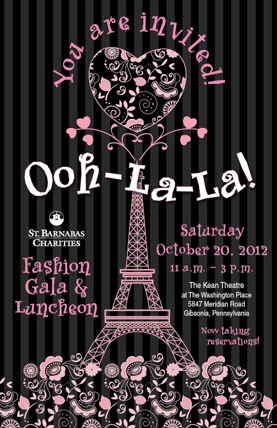 It’s time for St. Barnabas Charities’ annual fashion gala and luncheon, and this year’s theme is Ooh-La-La, The Heart of Fashion. The Parisian-themed fashion party will be held on Saturday, Oct. 20, at The Washington Place and Kean Theatre, 5847 Meridian Road, Gibsonia. Doors open at 11 and once again WPXI-TV’s Trisha Pittman will serve as mistress of ceremonies. During this delightful event, you will be whisked away to Paris for an afternoon of shopping with dozens of vendors, a lovely lunch and dessert, a fall fashion show and an over-the-top basket raffle. Tickets are $32 for the lunch, shopping and fashion show or $17 for shopping and fashion show only. Groups of six or more receive $5 off the ticket price. To make reservations, call (724) 444-5521 or visit www.StBarnabashealthSystem.com. Proceeds benefit the St. Barnabas Free Care Fund, and this year’s sponsors include: WPXI-TV, Event Sponsor; UPMC Health Plan – Runway Sponsor; Trib Total Media, Luncheon Sponsor; Northern Connection Magazine; Pinnacle Financial Strategies; Matoka & Sons Plumbing Co. Inc.; James Austin Company; Jack Buncher Foundation; Jim & Elin Roddey; ESB Bank; DeForest Koselnik Skinner & Berardinelli; MMC Land Management; Don & Kathy Seaton – Re/Max Select; and Reed & Witting Company.